I’ve never met a single person who doesn’t like Chick-fil-a. Indeed, if you’re not a fan of Chick-fil-a, I don’t think we can hang out together. And their customer service is impeccable. I think that is the coolest corporate culture concept ever. I had a high school pitcher in a few months ago for a Precision Strike, and when I thanked him for allowing me the privilege of working with him he smiled and replied, “It’s my pleasure.” I hugged him. During our Summer Training Program our entire staff met every Tuesday to have a case conference on each enrolled player. It was our way of making sure our player development team, our strength and conditioning coordinator, our nutrition director, and our student education and management departments were all on the same page and that every athlete was progressing toward his goals. Since the weekly meetings took place during the lunch hour, we provided meals for the staff. More times than not, those meals consisted of a huge Chick-fil-a nugget tray, a boatload of waffle fries (which, by the way are the best fries on the planet), a really big salad, a fruit tray, and of course… cookies. So yesterday we were doing some post-summer/fall cleaning and when our CFO/COO, Amy opened the bottom drawer of a giant horizontal file cabinet, she found approximately 8764 various and sundry packets of sauces. I mean who can argue that the original Chick-fil-a sauce isn’t one of the top five culinary accouterment ever concocted? But does that overzealous uber-servant at the counter really need to add 2563 packets to every order!? Also, do we really need 18 different condiment flavor options? Has anyone in the history of history ever figured out to open one of those hermetically sealed lock boxes of ketchup without igniting a tomato sauce explosion that turns the front of your shirt into a murder crime scene? My point is that when it comes to lunchtime delectables, more is not always better… more is just more. It’s like that in the baseball world too, especially when it comes to hitting. Listen, every good hitter I ever knew hit a lot. But is it really all about volume? Has anyone ever made real progress in hitting by simply getting more swings in? Ok, let’s say you’re struggling at the plate. I know… you never struggle, but go with me on this. The typical response to a bad stretch at the plate is to bury yourself in the cage and hit more — to try and bang your way out of it. It sounds reasonable, and the effort is laudable. But let’s say you dig in and take 5000 swings a day for a week. If you take those 5000 swings with no specific goal or a plan to change your movement pattern, then congratulations! You’ve just taken 5000 swings that reinforce the movement pattern that got you into your rut in the first place. To me that is the definition of insanity. On the other hand, if you start tinkering with your swing by “thinking about” anything while you’re hitting, you’re likely to make things worse. With a more targeted approach – one that addresses specifically, the individual deficits you need to improve upon – you would cut your training time exponentially and significantly expedite your improvement. So what do I mean by a “targeted approach”? Well, it would have to start with a head-to-toe physical evaluation designed to identify constraints in mobility, stability and motor control. Many times hitting instructors ask you to do things you are physically incapable of doing. Here’s an example: One of the most common attributes internet gurus identify in an elite swing pattern is the ability to open the hips while keeping the shoulders closed. The hitting coach tells his athlete that he must open his hips first, but keep his shoulders square to the plate to create an elastic stretch through the torso that can be used to generate bat speed. But what if his athlete has a limitation in thoracic spine and torso mobility that will not allow him to perform such a maneuver? If you haven’t looked for that variable, you can beat him over the head with a clipboard as much as you want, his swing will never change. Physical constraints and biomechanical constraints are intimately interwoven. Do you swing like that because you’re tight? Or are you tight because you swing like that? And there are dozens of physical deficits that could be preventing you from achieving an the elite swing pattern you desire. After physical exam, you would need to conduct a high-speed video analysis of your swing pattern. Elite hitters have several common characteristics in their swings. An elite swing pattern gives you the best opportunity to create optimal bat speed, early in the hitting zone, and affords you multiple levels of adjustability to allow you to adapt to changes in timing necessary to compete on a high level. There is no way one can see details of a swing with the naked eye. It happens too fast. But it’s also real easy to get lost in the weeds if you overuse video and aren’t able to narrow your focus to a few key markers common to the best of the best. Once you identify the physical and mechanical inefficiencies that are combining to prevent you from achieving the results you want, you need a specific, individualized plan to address each one. 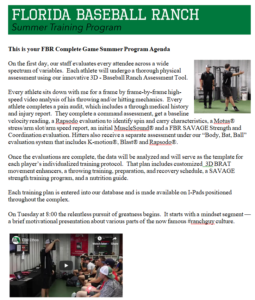 These must include corrective physical exercises grounded in proven physiologic principles as well as innovative hitting drills to elicit changes in the swing pattern. Did you notice that I haven’t mentioned anything about finding the right verbal or mental “cues” to change your swing? That’s because to be the most efficient and effective, all your training interventions must be viewed through the prism of motor learning. You see, athletes don’t learn movement skills through cognitive or verbal cues. In fact, when it comes to hitting, words get in the way. The motor learning research is very clear. All those magical, mystical verbal and mental cues you’ve been looking for are getting in your way. If you’re looking for a way to turbo charge your training and your hitting, we have the perfect solution. On Oct 22 at The Battery (the hitting wing of The Florida Baseball Ranch), we’ll be holding a special one-day hitting camp. It will run from 9 am to 5 pm with an hour for lunch (we’ll give you directions to the nearest Chick-fil-a). Each attendee will receive a full head-to-toe physical assessment and a video analysis of his or her swing (softball ladies are welcome). We’ll teach you all the corrective physical exercises and the hitting drills you’ll need to take your swing mechanics to an elite level, and you’ll learn critical motor learning concepts to help speed your learning curve. We’ll measure your baseline bat speed and ball exit velocity and teach you everything there is to know about optimum launch angles and ball flight. When you leave you’ll have a personalized written plan giving you explicit, easy-to-understand instructions for fast implementation. When you execute your individual plan, you’ll almost immediately begin to notice a change. Your bat speed and ball exit velocity will increase, you’ll barrel up more balls and your singles will turn into doubles and homers. Your newfound power will attract the attention of college and pro scouts, because in this game, power is everything, and power is RARE! Click here to learn more or to get registered. We’re limiting this camp to the first 20 applicants, and the slots are filling up fast. If you need to speak to us personally before you pull the trigger, call us at 866-787-4533. We’ll see you at The Battery!